The Tragic Story of the 1st Duke of Rothesay – History… the interesting bits! 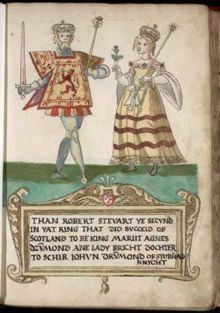 David Stewart was born on 24th October, 1378, the son of John, Earl of Carrick and heir to the throne, and Annabella Drummond. His grandfather was King Robert II, who was himself the grandson of Robert I the Bruce. 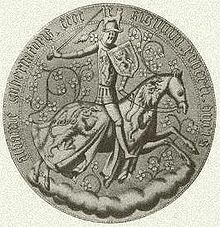 His father succeeded to the throne in 1390, taking the name King Robert III (John being considered an unlucky name for kings). David was created Earl of Carrick in the same year. Robert III, however, was an invalid – he had been kicked by a horse 2 years before his accession. Never having fully recovered from his injuries, he was also prone to depression. This severely limited his ability to govern and his younger brother, also called Robert, took over much of the administration of the realm. Robert Stewart was a ruthless politician with designs on the throne for himself. Towards the end of his father’s reign – following his brother’s injury – he had been protector of the realm; and it seems he intended to keep the position for the duration of his brother’s reign. From 1393 Robert III tried to rule for himself, but caused more division between the Highlands of the north and the Lowlands of the south; bribery and corruption were rife. In 1393 David married Elizabeth Dunbar, daughter of the Earl of March. However, they were close blood relations and had never obtained the required papal dispensation. They separated in 1397, although it is not clear whether an annulment was ever obtained. In April 1398 Robert III’s wife, Annabella, called a special council at which David, still only 19, was made Duke of Rothesay. It was the first ever creation of a duke in Scotland, and the title would, from that moment on, be borne by all heirs to the Scottish throne. He would also receive the title Earl of Atholl later in the same year. Annabella also had David named “Lieutenant of the Realm”, as a means of ensuring that David would succeed his increasingly frail father. This appointment essentially gave him the rule of Scotland, in his father’s place; although he was to consult with the full council, with his Uncle Robert as his primary advisor. In the same council Robert Stewart was made Duke of Albany. A power struggle developed between Albany and David. As their rivalry grew more intense the country was effectively divided into 2 factions. David, it seems, was of a ‘dissolute and licentious’ nature (Ashley) and almost as inept as his father. According to Tranter he was “high-spirited” and “not always noted for good judgement”. In 1400 David married Marjorie Douglas, daughter of Archibald the 3rd Earl of Douglas and his wife Joan, at Bothwell Church. She and David would have no children. The marriage itself caused the Earl of March – father of David’s 1st wife – to renounce his allegiance and swear fealty to Henry IV of England, thus prompting an English invasion. Henry managed to reach Edinburgh without much opposition. Once there he summoned Rothesay and Albany to pay homage to him, but neither did. David held Edinburgh Castle against Henry, whilst Albany had mustered an army 15 miles away at Calder Muir; but he failed to march to Rothesay’s aid. Henry IV was eventually forced to retire for lack of supplies, with the Scots powerless to take the advantage. David was blamed for provoking the English invasion. Following his mother’s death in 1401, his popularity was further damaged when he failed to consult his council, as was required, before taking a number of steps which threatened the positions of his nobles, especially his uncle. With Annabella’s death went David’s last protector. Albany, in alliance with David’s brother-in-law, the 4th Earl of Douglas, took action and had David waylaid on the road to St Andrews, arrested and held captive in St Andrews Castle, before being moved to Falkland Palace, supposedly hooded and mounted backwards on a mule. According to Tranter, David was flung into a cellar, with no food and water. There were stories of nursing mothers giving him their breast milk for sustenance, through a crack in the cellar’s masonry. He survived for at least 18 days, dying between 25th and 27th March 1402, aged 23. Some historians now think David died of dysentery; but whether he died of starvation or disease the result was the same; from April 1402 Robert, Duke of Albany, was in control of Scotland. A few weeks after his death a public inquiry, under the control of Albany, exonerated Albany and Douglas of any complicity in the death, ordering that no one should “murmur against” them. The inquiry concluded that David Stewart, Duke of Rothesay, had died “by divine providence and not otherwise”. 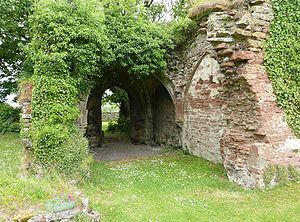 David was buried in Lindores Abbey, Fife. Following David’s death his widow, Marjorie, went on to marry Sir Walter Haliburton in 1403; she died sometime before 11th May 1421. The king, Robert III, took some time to realise that his 2nd son, James, may also be in danger. In 1406, the king arranged for him to be sent to France for his own safety Aged just 12, James was smuggled out of Scotland by ship, but was captured by pirates off Flamborough Head, and handed over to the English to begin 18 years of imprisonment. King Robert III died of grief shortly after. Albany was, thereafter, the effective ruler of Scotland until his death in 1420. Pingback: James I and Joan Beaufort: A Royal Love Story – History… the interesting bits!